This whole adventure started quite innocently during a phone call with my brother Marty over the Christmas holidays, and my announcement that a full family trip out West might not be possible. I let him know that I would like to set up some kind of backcountry trip with him given that we hadn’t seen each other in over 4 years. 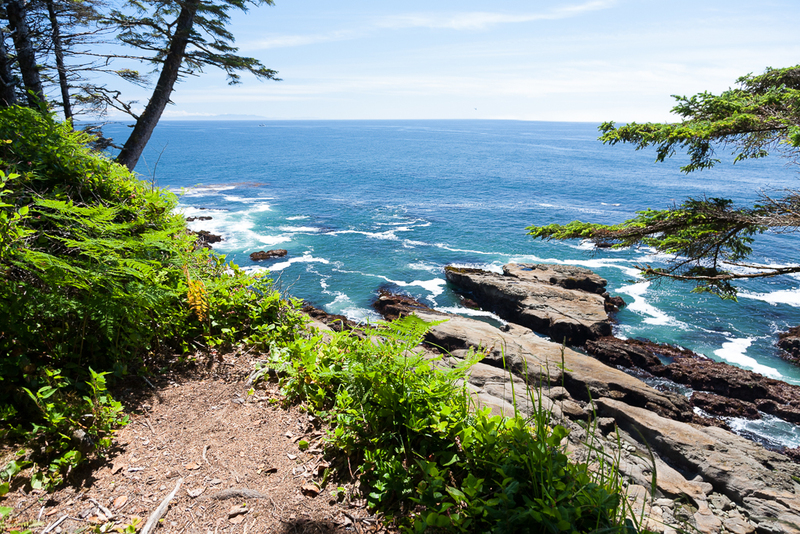 His suggestion that we do the West Coast Trail was intriguing, if not daunting. The trail has a formidable reputation, presenting exquisite rewards, but at a price. If you want to get a fuller description of the sensory & physical experiences to be had, and enjoy surprises, then read the accompanying article here – it strives to immerse you in the range of experiences tied to the many facets of the WCT, and will describe with words and images what you can expect to experience. Hopefully, they will elicit either a “this isn’t for me…”, or a “sign me up!” response – both of which are valid. What follows is an itinerary layout that organizes the trail experience on a day by day basis, with links to photo galleries that I hope will allow you to live vicariously through them if you are unable to make the trip. It describes our successes, challenges and rewards along the way. A section with planning tips and links to resources round out this report. The bottom line: This trail is for experienced backpackers, but if you are a backpacker with prior experience on multi-day trips, it is non-technical, completely doable, and yes – the trip of a lifetime! Getting out of Victoria was an unexpected challenge! We left our hotel at 6:30, but my brother was having trouble following my “turn here” directions. As a result, we got briefly entangled in a strip mall parking lot, and best of all, entered the McDonald’s parking lot via the drive-thru exit lane. You should have seen the look of bewilderment on the drive-thru employee’s face, and we were lucky that only one of the two split lanes was occupied! By Eastern standards, Highway 14 along the western edge of Vancouver Island is slow going. Passing opportunities are few, and the twists and turns require constant attention. It would be difficult to beat Google Maps’ estimated trip duration of 2 hours on this one. We stopped at one of the bays enroute for a stretch break, and managed to arrive at the Gordon River trailhead with a half hour to spare. A parking lot is located across the road from the park office, and parking costs $5/day or $30 for the week (this is a private operation – phone the Gordon River park office if you are doing this trip in 2017 or beyond to confirm that this option still exists). 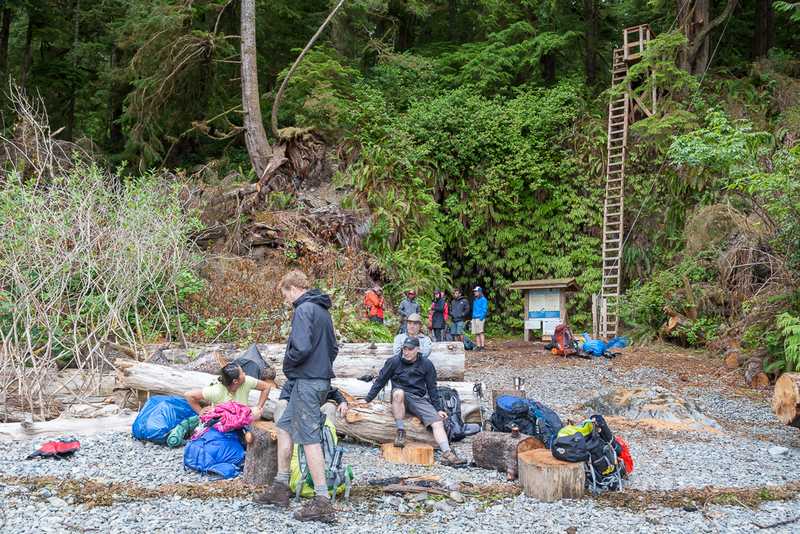 We took a few minutes to explore the beach at the private campground nearby, and watched Butch the ferry operator return from the trailhead with a few hikers who had spent the night there on the first run of the day. Our shuttle bus left the park office on time, and so began a 3 hour ride to the Pachena Bay trailhead at the north end of the trail. The first half of the ride was on narrow paved road and the driver slowed down frequently to go around certain dips. The second half was on logging roads. The washboard surface ensured that we would be subjected to a bone jarring trip, and some joked with our driver that the bolts on the bus wouldn’t hold, and that he would need a new bus for the next day’s run! Exhausted from the ride, we arrived at Pachena Bay and snacked while waiting for our orientation session to start. Sarah did a great job covering backpacking etiquette, safety issues and the wildlife we might encounter. With that, we were advised to avoid the beach route option from the trailhead due to a bear being in the area… Hikers shuffled to her desk to receive their permits, and by 3pm, we were finally off! Within moments, we had a traffic jam at the first set of ladders. Once we got through them, our cohort had an opportunity to disperse, and we seldom had to wait for others at the ladders after that. Exhausted, we almost missed an opportunity to see the sea lions at the haul out rock at km 9 (referenced in the Wildlife section above). The unmistakable shrill, chirpy cry of bald eagles alerted us to their presence here, and we also saw a gray whale at this same location. We were exhausted by the time we reached Pachena Lighthouse, and it was here that we agreed to stay at Michigan Creek rather than Darling River as originally planned – saving us the additional 2kms on this already long day. We pretty much bonked when we did finally arrive at Michigan Creek, and were happy to settle in for the night after building a campfire. A fog bank gave way to clear blue skies early in the day. Unlike the previous day, which was spent entirely on the inland route out of necessity, we were able to maximize the beach options, and spend about ½ the day by the ocean. Leaving Michigan Creek, we took our time exploring tide pools, until we were forced off the beach again at Tsocowis Creek, where we saw a First Nations guardian cabin, but no sign of human activity. In fact, save for a crew that was being picked up by helicopter near Owen Point, we did not see any parks staff, or First Nations trail guardians on the trail during the entire week. We caught up to Team Tom at Valencia Bluffs (km 18), and were soon joined by another member of our cohort, Nadav. Finding bright red Algoma chairs there was a surprise, and this seemed as good a place as any to drop our packs and have a snack/lunch. The seascape below held our attention for long moments at a time as we watched the waves wash over the rocks, and tried to understand and anticipate their patterns leading up to peak wave action. 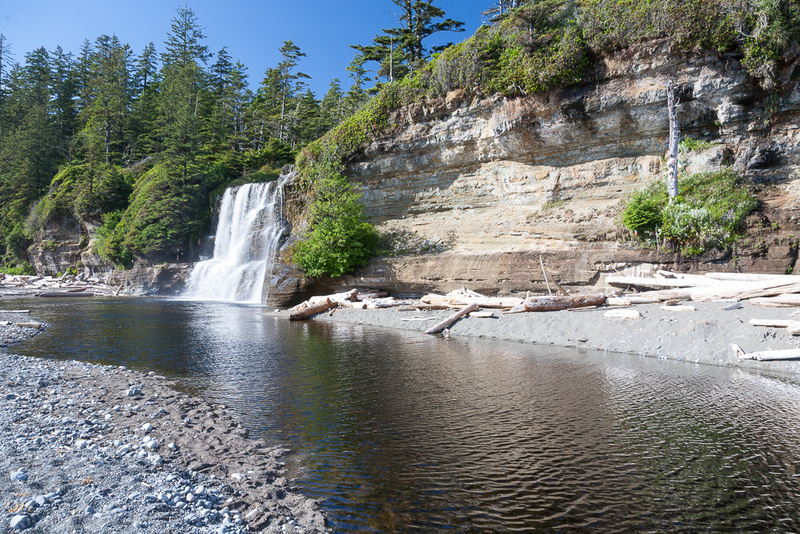 A couple of kilometres past the Bluffs, we were forced onto a beach route at Trestle Creek. This would be a short segment on the beach as we were soon scouting for the telltale beach access markings (usually a ragtag collection of colourful buoys) 2 kms later to find the short trail up to our first cable crossing at Klanawa River. Compared to the creeks we had seen until now, the Klanawa River was wide and fast moving. Extra care was taken when placing backpacks and hiking poles into the cable car to avoid any unfortunate losses. We agreed that I would go first, and the first half of the trip across the river is quite easy – gravity does all the work! Once at the middle, I had to pull the rope to get to the other side. Given my weight, and the weight of my pack, getting across took less effort than I thought it might. Once on the other side, I quickly set up my video camera to capture Marty’s crossing. A minute or two after passing the midway point, Marty reminded me that he helped me get across by pulling the rope, and wouldn’t mind me returning the favour (his actual words were a little more course than those used here…). The next section of the trail presented us with a good number of mud obstacles. Marty underestimated the depth of one of these, and he was quite surprised to find his boot filled with liquid mud in less than a second! A bridge crosses the Tsusiat River, and we took a few minutes to stop and admire the water falling off the edge of the cliff from above the falls. Directly beyond was the Pacific Ocean, and in the absence of any visual cues related to the beach below, the perspective from this vantage point made it look like the Tsusiat River simply flowed into the ocean. My list of regrets is very short as it relates to this trip, but one is that I did not return to this spot once our camp was set up so that I could hike along the bank of the river to a point closer to where the river spilled over the edge to get pictures from there. We arrived at Tsusiat Falls campsite at a time when choice spots were still available. Not wanting to miss an opportunity to take pictures of the falls without too many people in the frame, we dropped our packs where the tent would be set up, and I boogied to the falls to get the best shots possible before others arrived. The Falls are simply spectacular, and a welcome spot to freshen up. Light fog had rolled in for what would be our longest day of hiking. The tide was not an issue when we rounded Tsusiat Point, and we got to Nitinat Narrows without too much effort. A steep wall of mud covered roots stood between us and the landing for the ferry. We made it up and over ok. Others got a little dirty getting through though, but managed to laugh about it afterward. 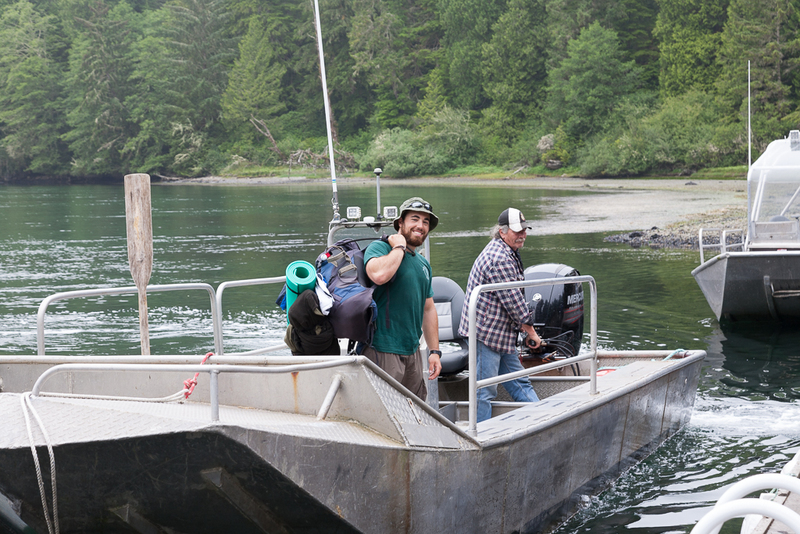 A family run business awaited us at the dock on the south side of the Narrows. There, we were told we could help ourselves to the cold beers in the cooler (payment was on the honour system just before departing), and consider ordering Dungeness crab or grilled salmon amongst other options, which we did. This was absolutely the culinary highlight of our time on the trail! We settled into our resin chairs with lunch and a drink, and were happy to watch the comings and goings of the ferry boat, fishermen, and other hikers. The feeling that accompanies a lazy afternoon started to set in, but the knowledge that we still had almost 10 more kilometers to go acted as a cold shower. We bought a few cans to take with us, thanked Tamica and Leon for their hospitality and great food, and were on our way. My gut started to feel unsettled about this time… I attributed this to lack of sleep, change in diet, and constant physical effort. It wasn’t affecting my ability to hike, but I did have to monitor its status. This day will almost entirely be on the beach route, save for the short climb up, around and down Carmanah Point. 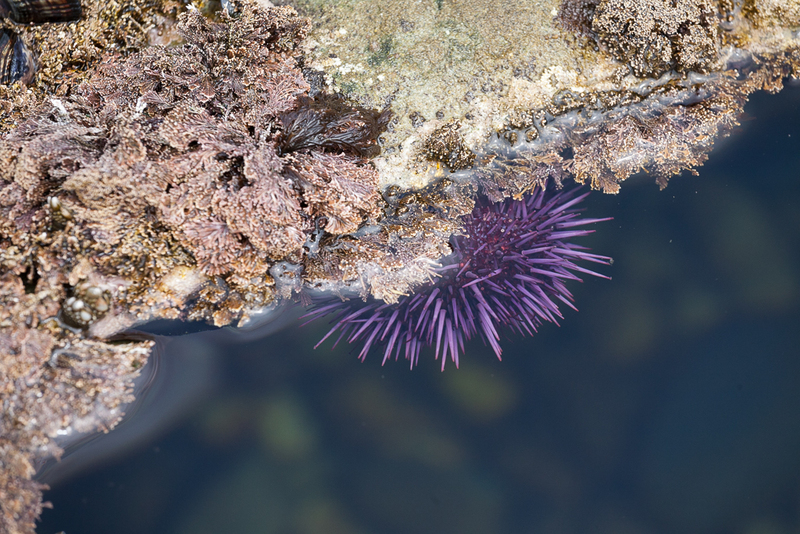 The pace was easy, with plenty of time to explore more tide pools, and the sea lion haul out rock just before Carmanah Point. It was at Cribs Creek that we had a conversation with an English chap, Steve, who had spent the better part of a year touring the U.S. and Canada. He had passed us on the trail the previous day, and we learned that he was covering longer distances per day with the hope of completing the trail in 4 or 5 days. Steve was off to a very early start, but had to turn back twice because the high tide had not receded enough yet. We arrived at Chez Monique immediately after descending the promontory on which Carmanah Lighthouse sits, and quickly placed orders for beef and veggie burgers, and a couple of beers to wash them down. My beef burger was pretty average, and not up to the reputation that others have created – my crab lunch at Nitinat Narrows beat this hands down! Marty and others reported that their veggie burgers were excellent – so maybe that’s the way to go if ever I am back in this neck of the woods… I bought whisky here to bring to Walbran Creek, and soon we were off again. 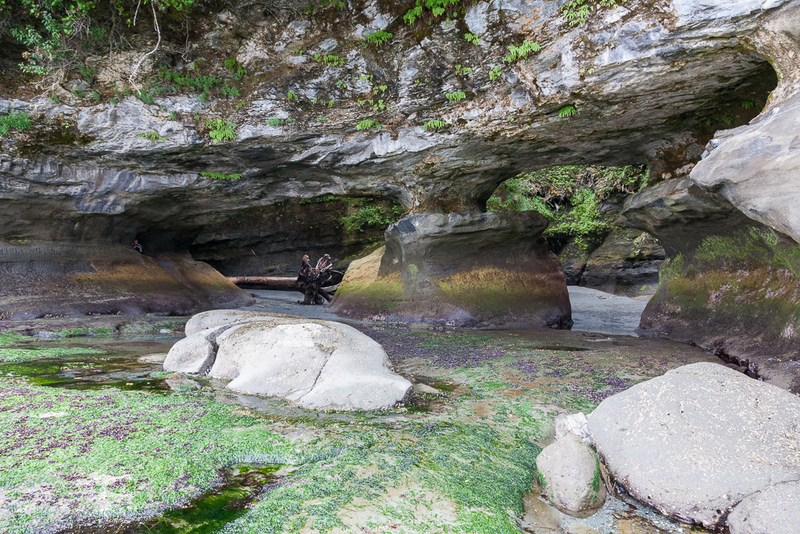 We avoided the cable car at Walbran Creek by throwing our boots across the creek to the other side and walking barefoot across the creek. My boots landed safely on the other side, but one of Marty’s didn’t. Thankfully, it had time to dry out by the time we left the next morning. Markita & TJ (a northbound brother and sister duo from Banff) greeted us upon our arrival, and pointed out a level spot to pitch a tent next to theirs. My gurgly tummy was still an issue, and I checked in with the members of Team Tom to see if any of them had any Imodium to spare. Sheila was kind enough to offer up a ½ dozen tablets, and I didn’t waste any time popping a couple after thanking her for them. This day would be entirely on the inland route, with the highlight being the approach to, and crossing of Logan Creek. Very steep ladders took us down to a narrow and bouncy suspension bridge. While Marty was happy to spend time on it taking pictures and generally checking things out, I just wanted to get across. A set of low and high pitch ladders took us back up to the height of land on the other side of the creek where we discovered logs and an ideal spot for lunch waiting for us. A group of 5 (mostly brothers) from Alberta caught up to us here and we spent some time chatting with them before moving on. 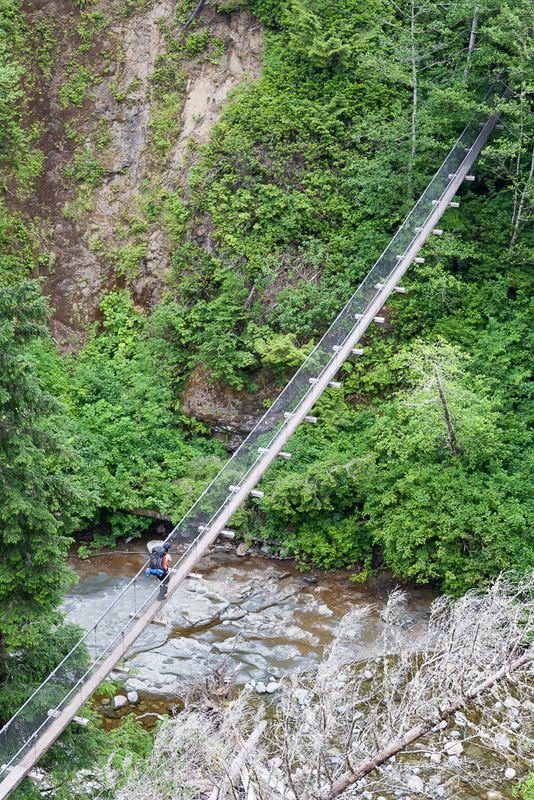 We easily picked our way across Cullite Creek to avoid the cable car there, and enjoyed watching creeks spill over rocks at a few of the bridges before reaching Camper Creek. It is also on this day that we mastered the art of circumnavigating the wettest of mud holes (the 60 km marker was in the middle of a mud pond on the trail), and learned to cross the largest and longest cedar tree log bridges – many of which were coated in a thin layer of mud. Despite having taken a few Imodium, my discomfort was still front of mind. When we caught up to Jack & Nate at Camper Creek, Nate offered up a few more along with the advice to take a more aggressive dosage than I had been doing (I would finally be back to my normal self by the next morning). Here we exchanged brief hellos with a lone figure, Byron, who preferred to keep to himself and the book he was reading. As we went about our morning rituals, with me taking a few campsite pictures, Byron made his way over to our little group and offered to take a picture for us. We learned that Byron would be staying put here for the day while he waited for his brother to catch up to him so they could do the trip together from there. A late start on this morning ensured that we would reach Owen Point at low tide, which made for what was most likely the best day of our trip. We enjoyed investigating some of the smaller surge channels, and took a chance by crossing one of them using the wobbly log that lay across it. With the tide being at its lowest level, we had full access to the caves at Owen Point, and we were impressed with the striations and colours of the rock faces. We spent almost a ½ hour checking out the caves, and enjoyed lunch with a northbound couple on the small beach just south of the caves. Marty accepted her offering of freshly baked muffins. Almost as fun as the caves was the long stretch of boulders that required hopping and remained between us and our campsite at Thrasher Cove. We enjoyed cooling our feet in the ocean before pressing on, once again feeling the pressure to move as a result of a rising tide. Later that evening, I enjoyed a quiet conversation with Nate and reached the conclusion that after 6 full days on the WCT, I was “done” and ready to go home. An eagle made 2 consecutive hunting sorties, but as Murphy’s Law would have it, did not make a 3rd outing from its nest when I was ready to take a few shots with my camera. We set up our tent at the southernmost end of Thrasher Cove on a mini point of sorts on the beach. We thought our tent placement was out of the reach of the rising tide, but one wave slide over the top of a rock slab, and came within 1 foot of our tent wall! Marty and I quickly made an improvised “sea wall” by using available rocks and backfilling the cracks with sand. We monitored the incoming tide until at least 20 minutes after the high tide hour, and were prepared to quickly move the tent if need be, but did not have to in the end. Sleep did not come easily that night. I was still tossing and turning after midnight when I decided to go out for a pee. I was gobsmacked by the beautiful night sky above me, and decided to take a few pictures of the Milky Way before turning in for the night. Marty and I were in sync and all business on this final morning. Our mutual goal was to pack up, get out, and be at the ferry dock shortly after noon if at all possible. A light rain was upon us soon after waking up, and we sought refuge under the bows of a large tree to prepare our breakfast, as well as pack everything up. We were efficient at saying our farewells, with the expectation that we would find the other members of our cohort at the pub in Port Renfrew for lunch. The fine drizzle had an unexpected impact on our progress – this was not the time to take pictures for fear of inflicting costly damage to my camera gear, and so we made very few stops this day. We were slowed down by only two situations: we stopped long enough to check out the donkey engine near km 72; and we encountered an unexpected array of side (unofficial) trails meandering away from and then back to what we believed was the main trail. More trail markings in this area would have been appreciated. We arrived at the ferry dock at 12:10, at least one crossing ahead of what we had hoped for (ferry crossings at Nitinat Narrows are ad hoc throughout the day while the crossings at Gordon River are scheduled). With 20 minutes to spare, we high fived and asked a member from another group of hikers to take a few pictures of Marty and me at the trailhead for us. At least half an hour passed before we realized that Butch the ferry operator only makes the crossing at the designated times IF the ball is raised at the trailhead. I have to admit that I did see the information panel instructing hikers to raise the ball (buoy on a rope and pulley) to alert the ferry operator to your presence, but I assumed incorrectly that he would always make the crossing in accordance with the schedule. As a result of our unplanned delay, Paul, Emma, Jack and Nate from our cohort caught up to us. More high fives and photos ensued, and we waited together for the next ferry crossing scheduled for 1:30. A local taxi operator helped six members of our cohort get to the Port Renfrew Pub for an excellent lunch. A spontaneous sing along of our national anthem on this Canada Day erupted, and it was the perfect ending to an excellent trip!! Marty warned me that the trail had admirers on a global scale, and that we would be lucky to secure spots for the 75km trek during a specific set of dates that worked between gigs for him. I have done pretty well in the past with getting the bookings that I wanted at different parks, save for one, Mount Katahdin, in Baxter State Park, Maine (a true lottery if there ever was one). Parks Canada was introducing an online reservation system for this trail for the 2016 season, and the reservation window was scheduled to open at 8:00am PST on January 11th. I was thinking of taking a ½ day off from work to take care of this important task, but the rational side of my brain took over and I settled for blocking an hour in my work calendar to get this job done. Our places were booked as of 8:15am PST that same day (that was easy!). Parks Canada recommended that hikers create a reservation system user profile ahead of time, and this saved me time during the reservation process. We chose the last week of June 2016 with a plan to complete the trip in time to see the Canada Day fireworks in Victoria. 3 ½ weeks later (i.e., the end of February), I checked the reservation system “just for fun”, and quickly learned that, with the exception of a couple of mid-week dates earlier in June, the entire peak season running from mid-June to Labour Day was sold out. Getting to the trailhead and executing this trek requires a very good understanding of the logistical challenges that await you. A must read is the Hiker Preparation Guide published by Parks Canada. From there, blog posts written by other trekkers, and guide books like Blisters and Bliss will help you to understand getting to and from the trailheads, trail conditions, sources of reliable water and must see locations. We decided to do the trail from north to south so that our packs would be lightest when we reached the highest concentration of ladders. With that, we opted to park our vehicle at the Gordon River trailhead and take the West Coast Trail Express shuttle service to Pachena Bay. Others in our cohort opted to park cars in Port Alberni, and take a ferry to Bamfield where a short taxi ride would get them to the Pachena Bay trailhead. Getting out involved either a shuttle bus or private boat to get back to Bamfield, while others took the shuttle to Victoria. 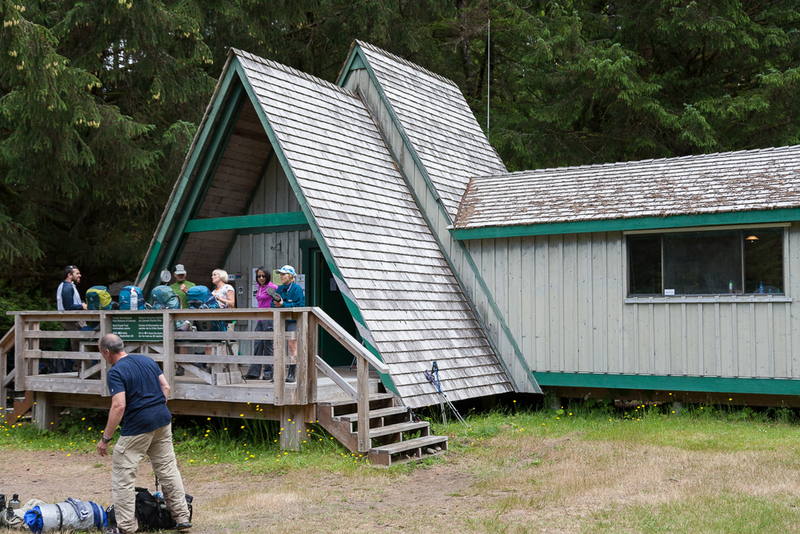 Some members of our cohort spent a night at Port Renfrew at the West Coast Trail Lodge on their last day. The idea of a hot shower after this kind of trip, and a comfortable bed being available right there, is certainly appealing. My personal preference was to make a clean break, and ease the transition to civilization, by heading straight back to Victoria. If I had a few extra days in the area, staying in Port Renfrew would certainly have been an interesting option. The 2 hour car ride back to Victoria was not easy though with have just eaten a heavy lunch, and having spent 7 days outdoors. Do you plan on playing the physical game, or the experiential game? Some will want to cover the ground as quickly as possible in 4 or 5 days, making it a true test of endurance. Others will opt for the long game, and the opportunity to see, hear and touch along the way. The 7 day plan is the way to go for most people. On most days, you can set out at pretty much any time knowing that you will arrive at your next destination at a decent time for dinner. MEC has an excellent checklist for this type of trip, so I won’t bother you with the details here. We had done multi-day backpacking trips before, but being out for 7 days was going to be a first for both of us. As a result, our packs were probably 5 to 10 lbs heavier than they should have been. Donating/eating food got us back to decent pack weights, but we did suffer under the weight of our packs for the first few days. We dined on the trail at Nitinat Narrows and again at Chez Monique, which we could have factored in more tightly when determining how much to bring to eat. I did make one conscious sacrifice in weight so that I could bring my DSLR camera and 2nd lens for wildlife close-ups. I wasn’t happy with my point & shoot results from prior trips, and wanted the best possible shots from what many describe as a bucket list trip. I also made a last minute decision to leave the carbon fiber tripod behind, and bring a combination of two lightweight miniature options instead (Gorilla Pod + PEDCO ultrapod), which worked quite nicely for me in the end. My first aid kit follows me pretty much everywhere I go, and I had anticipated the need for Ibuprofen, but what I missed and should have known from past experience was to bring Imodium. Having read so much about mud conditions on the trail, I bought a pair of Gore-Tex boots for this occasion, but finally decided to bring my well-worn all leather boots (for ultimate comfort) once I was able to confirm that little to no rain was in the forecast for our entire trip. Ensure that critical gear like your backpack and boots are well broken in. I did a shakedown weekend backpacking outing at a provincial park in my region with a new pack a few weeks before doing the WCT, but my hip belt and shoulder harness were truly comfortable only after having done 30kms or so on the WCT. Until that point in time, I was forced to shift the pain on an alternating basis between my hips and my shoulders. Didn’t get enough? This HD video (720p) captures in 22 minutes what we experienced over the course of 7 days, and includes bonus footage not found in the photo galleries linked to above.